Oldsmobile’s product lineup was pretty drab in the 1990s. There was the ubiquitous Cutlass Ciera, the Blazer-based Bravada, the last gasps of the Toronado and a litany of forgettable luxury cars that are forever lost to the sands of time. Finally, in 1995, Oldsmobile introduced a new flagship intended to take the world by storm. 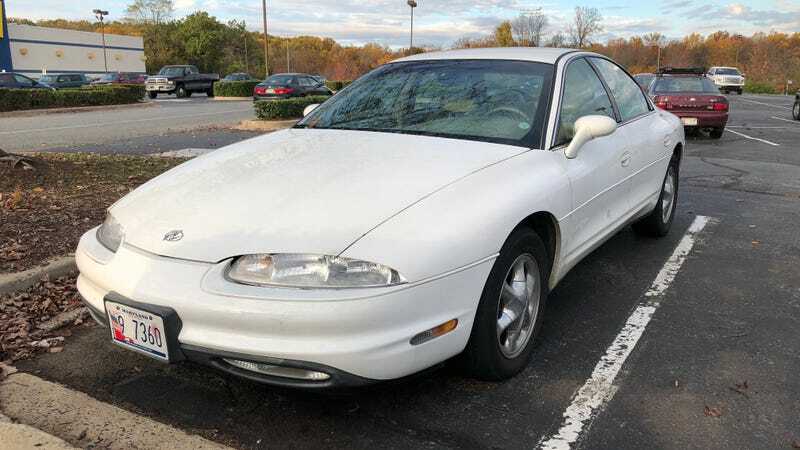 Enter the Oldsmobile Aurora. The Aurora was a Cadillac-based luxury space ship powered by a highly “advanced” 4-liter, Northstar-derived V8 that sent power to only the front wheels. Nothing says luxury like a tiny V8 and torque steer. General Motors had some front-wheel drive V8s in the past so why not try it again? Auroras were high-tech for the time. It had a Bose sound system, a new unibody frame and even real wood accents on the inside! Am I allowed to think the Aurora is cool? Despite the Aurora selling pretty well, you don’t really see too many Auroras driving around anymore, so I was pleasantly surprised when I saw one. I spotted this first-generation Aurora parked in the far corner of a Best-Buy parking lot. Despite it being a ‘90s Oldsmobile, it managed to stand out a bit in the lot. It had more presence than the other Hondas, Toyotas and Jeeps parked around it. The first thing people notice about the Aurora is how big it is and how bizarre the back half of the car looks. The tail lights are just one giant red lens on the back. It’s simultaneously extremely ‘90s and futuristic. If Eli Olds, the founder of Oldsmobile, had to design a future car, it might look like this. I like the Aurora and I’m glad someone is still driving it around. We need more front-wheel drive V8 luxo-barges lumbering around the streets.